Scott Hempleman started at UC Clermont as a CCP (high school) student. He graduated with his associates in 2016 before transferring to main campus. 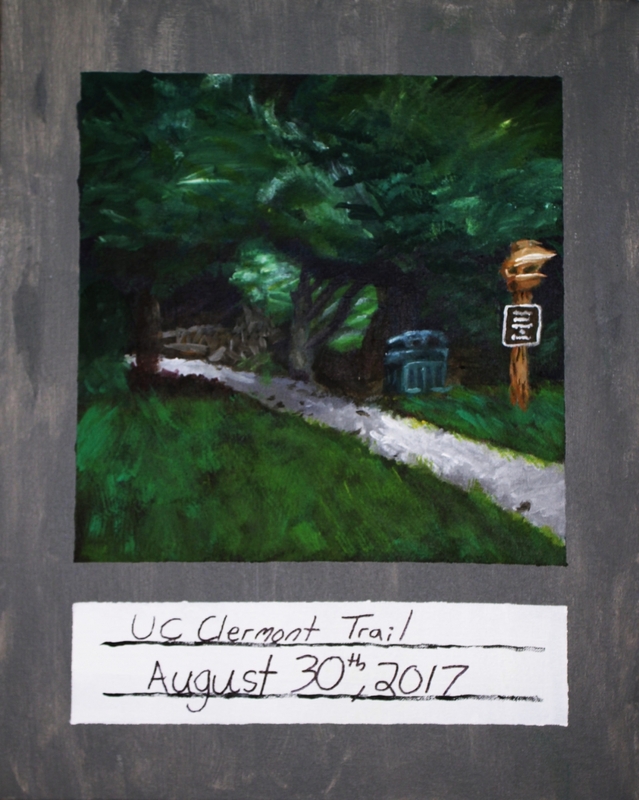 Last semester, Scott came back to Clermont to take Paintings II. He is currently majoring in Psychology with a minor in the arts. 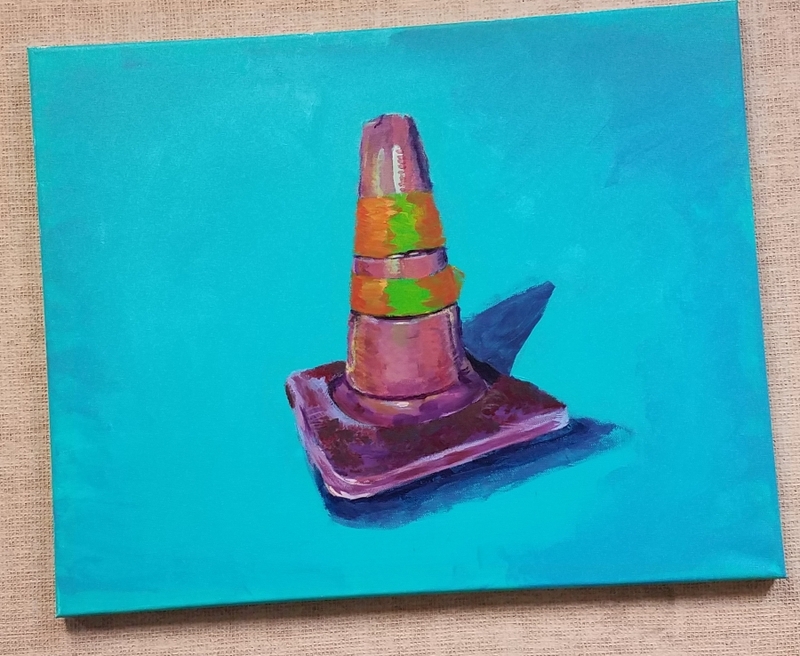 This semester, Scott Hempleman’s art is being showcased in the student exhibit in the library. 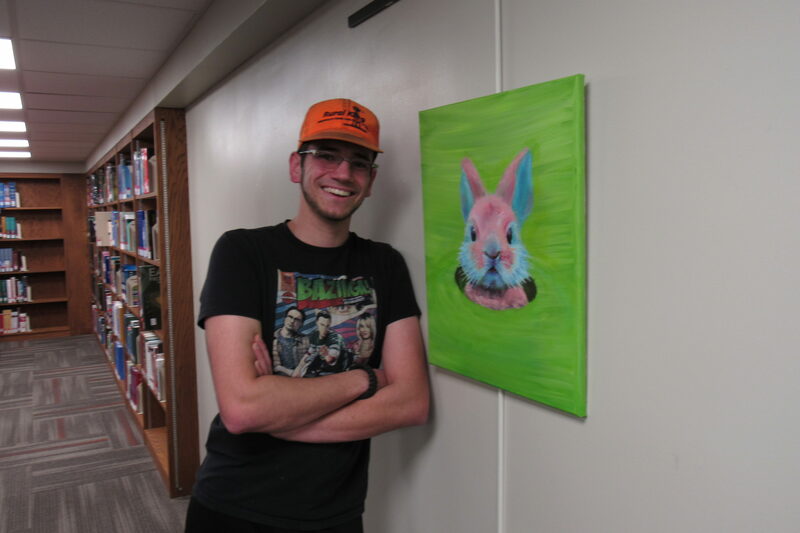 His art can also be found in the glass case outside the art room, along with works by other students at Clermont. While he plans on furthering his career as an electrician after college, he is still passionate about using his degree in the future to give back to the community. Ever since he was a little kid, Scott has been creating art. “I have this memory of my mom and my grandma taking me to this little [community]building.” As a five-year-old, Scott found his muse in animated characters. During his time at the art center, Scott remembers drawing Stitch from Lilo and Stitch, Chazard the Pokémon, and characters from The Simpsons. This influence is still present in Scott’s work today, as seen in the piece “Just Popping By” that is displayed in the library. 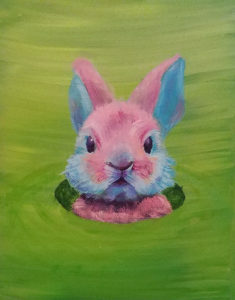 Scott painted “Just Popping By” for his girlfriend, Stephanie Peterson, after she had talked about wanting a painting of a bunny. 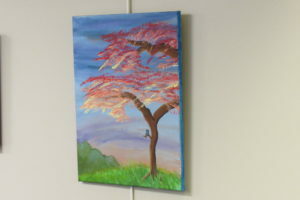 Stephanie’s work is also displayed in the library as a collaborative piece they created together—a landscape featuring a tree and a bluebird. 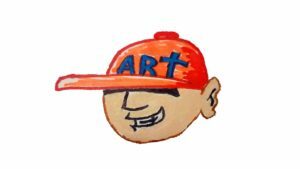 Last semester, Scott was awarded a $25 gift card as the recipient of Clermont’s East Fork Journal Editor’s choice award for visual art. Scott decided to submit his landscapes to the journal after his professor, Kim Taylor, encouraged him to do so. It was the landscape “Scene Three Collage” that was chosen as the fall issue cover. 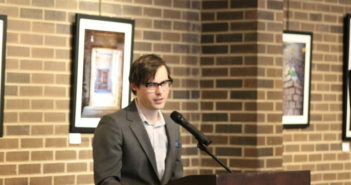 Scott was surprised when he was contacted about his art being featured. “Ever since I was a little kid, I just wanted my art to be recognized.” Now, as an adult, Scott’s art is finally getting the attention it deserves. 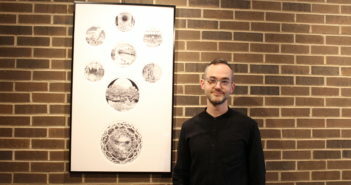 In March, Scott will be meeting with management of The Goshen Grind to talk about displaying his art in their café. 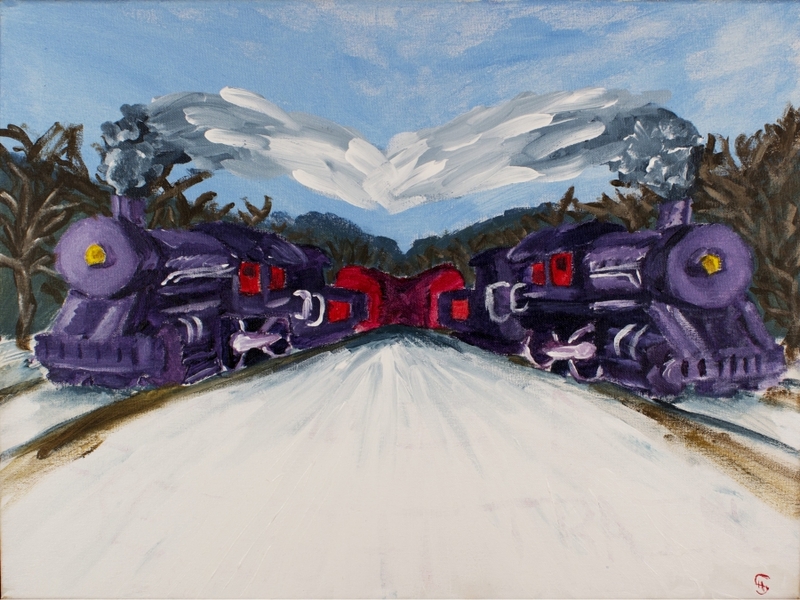 One of Scott’s favorite pieces featured in the library is the painting titled “ADHD is a freight train.” Scott painted the train as an ad campaign assignment for an English class. 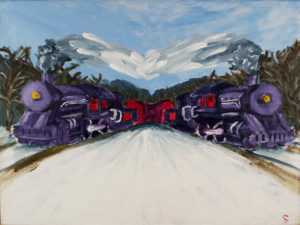 The train symbolizes the many thoughts that race and overlap in the ADHD brain; Scott describes this feeling as being hit by a freight train. https://www.facebook.com/groups/352345474894441/about/ to contact Scott through his Facebook group, Orange Hat Art. Captions below provided by the artist, Scott Hempleman. “Scene 3 (Collage and Painting)” When coming up with the landscape design, I instantly thought about the awesome and twisty rivers that I saw when flying over Arizona. So, I imagined what the perspective would have looked like if I was on the ground. Scene 3 is an outcome of imagination. Erin is an English Secondary Education Major. She moved to Clermont County from Arkansas two years ago. 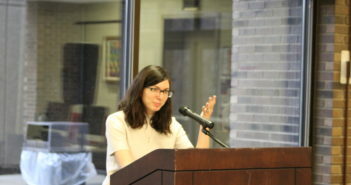 She is a writing tutor in the Learning Center as well as an editor for the Eastfork Literary Journal. If you see her, say "Hi"; she loves meeting new people.